Credit: Howard Perlman, USGS; globe illustration by Jack Cook, Woods Hole Oceanographic Institution (©); Adam Nieman. Earth is the blue planet. Two-thirds of its surface covered in oceans; its skies are swathed in cloud. And here in England, right now, it seems most of the air is water falling steadily from the sky. But how much water is there, compared to the mass of the Earth? The graphic, borrowed from the US Geological Survey, shows it's not as much as you might think. 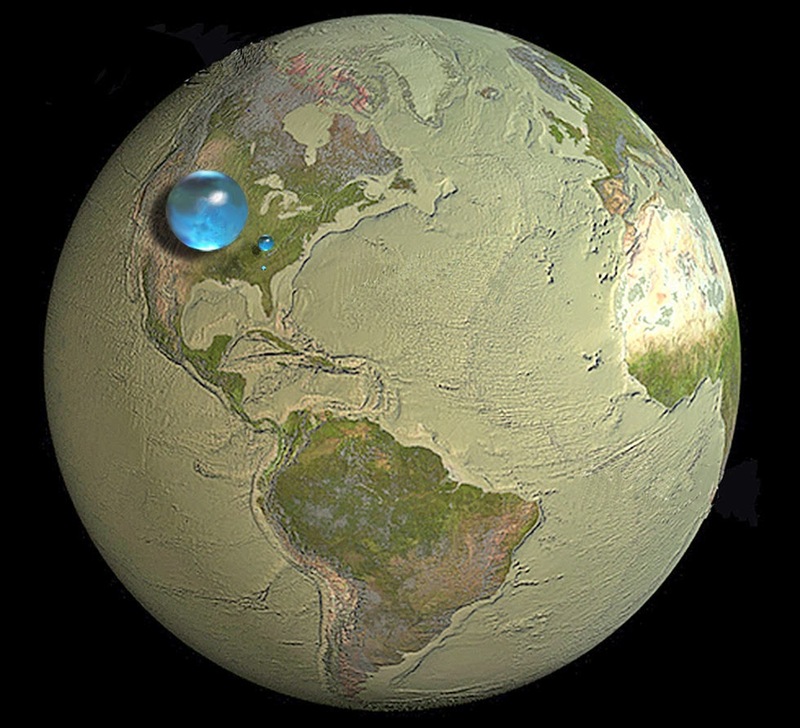 The largest blue sphere is the water in Earth's oceans; the smaller sphere to the right is the total amount of freshwater (in the ground, in lakes, rivers and swamps); the tiny sphere below that is the amount in rivers in lakes - the fresh water that's readily available. There's also a hidden ocean in the upper mantle, in pores of clays and other minerals, and water in the rocks deep in the lower mantle, maybe all the way to the earth's core. No one knows for sure, but best estimates are around two oceans worth - which means the total amount of water on and in the planet is around 0.1% of its mass. It isn't much, compared to icy moons like Jupiter's Europa, or Saturn's Enceladus. But maybe just enough to allow civilisations like ours evolve. Because if the water content of the Earth was just 1% of its mass, rather than 0.1%, it would be a water world, completely covered in deep ocean. Water worlds may be very common. Three quarters of the catalogue of discoveries made by the Kepler space telescope are mini-Neptunes: planets up to ten times the mass of the Earth, but with low density, suggesting that they possess thick hydrogen-helium atmosphere. Those close enough to their stars may have lost most of their original atmosphere, blown away on the stellar wind, leaving behind rocky cores completely enveloped in liquid water. Although life might thrive on many of them, it is unlikely than any world that lacks dry land could harbour an advanced technological civilisation like our own - how could you smelt metals, or build a computer underwater? So while the equivalent of dolphins of intelligent squid may evolve on these planet-wide oceans, they probably wouldn't be able to develop ways of escaping their planet, or communicating with us. Another factor contributing to the Great Silence, perhaps. As the people of Somerset and the Thames Valley know, you can definitely have too much of a good thing.